She shall be called Lulu! 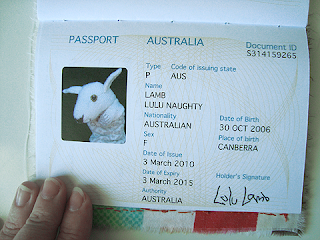 she'll be a very well travelled sheep! I'll take Lulu for a bit if you don't mind. Woolworth is dying to meet her. Did you have a plan as to when she should return home? Looks like I'll be back in Aus in Aug (because I just can't stay away) and I could bring her back then. Or she could just keep globe trotting.